Command Tutorial Create basic geometric objects such as lines, circles, and hatched areas. 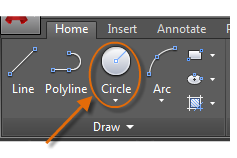 Create basic geometric objects such as lines, circles, and hatched areas. You can create a lot of different types of geometric objects in AutoCAD, but you only need to know a few of them for most 2D drawings. 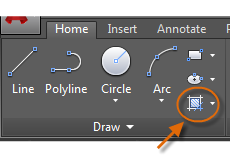 Tip: If you want to simplify the display while you create geometric objects, press F12 to turn off dynamic input. 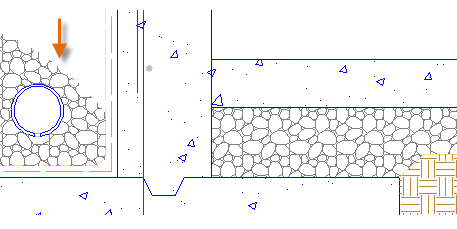 The line is the most basic and common object in AutoCAD drawings. 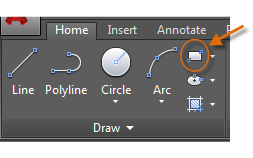 To draw a line, click the Line tool. Alternatively, you can type LINE or just L in the Command window, and then press Enter or the Spacebar. Notice the prompt in the Command window for a point location. To specify the starting point for this line, you would type in the coordinates 0,0. It is a good idea to locate one corner of your model at 0,0, which is called the origin point. To locate additional points, you could specify additional X,Y coordinate locations in the drawing area, however more efficient methods for specifying points are available, and will be presented in the Precision topic. After you specify the next point, the LINE command automatically repeats itself, and it keeps prompting you for additional points. Press Enter or the Spacebar to end the sequence. The user coordinate system (UCS) icon indicates the direction of the positive X and Y axis for any coordinates that you enter, and it also defines the horizontal and vertical directions in a drawing. 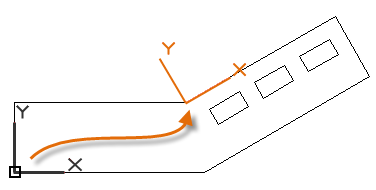 In some 2D drawings, it can be convenient to click, drag, and rotate the UCS to change the origin point, and the horizontal and vertical directions. Some people like working with grid lines as a reference, while others prefer working in a blank area. To turn off the grid display, press F7. Even with the grid turned off, you can force your cursor to snap to grid increments by pressing F9. 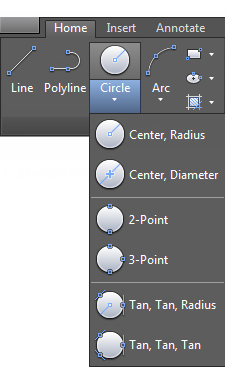 The default option of the CIRCLE command requires you to specify a center point and a radius. Alternatively, you can also enter CIRCLE or just C in the Command window and click to choose an option. If you do, you can specify a center point, or you can click one of the highlighted command options as shown below. Circles can be useful as reference geometry. For example, you can see that the two doors in the illustration can interfere with each other. A polyline is a connected sequence of line or arc segments that is created as a single object. Polylines can have a constant width or they can have different starting and ending widths. After you specify the first point of the polyline, you can use the Width option to specify the width of all subsequently created segments. You can change the width value at any time, even as you create new segments. Here is an example of a printed circuit board in which the traces were created with wide polylines. The landing pads were created with the DONUT command. A fast way to create closed rectangular polylines is to use the RECTANG command (enter REC in the Command window). 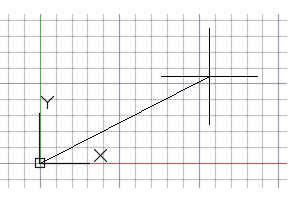 Simply click two diagonal points for the rectangle as illustrated. If you use this method, turn on grid snap (F9) for precision. 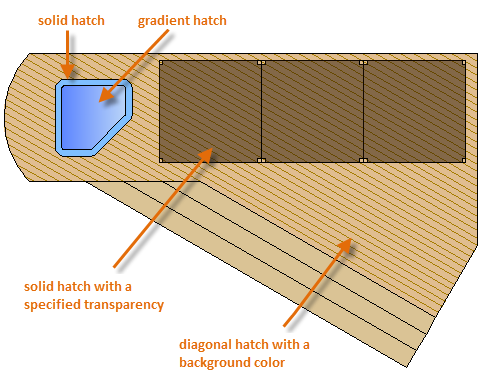 In AutoCAD, a hatch is a single, compound object that covers a specified area with a pattern of lines, dots, shapes, a solid fill color, or a gradient fill. When you start the HATCH command, the ribbon temporarily displays the Hatch Creation tab. On this tab, you can choose from more than 70 industry-standard imperial and ISO hatch patterns, along with many specialized options. The simplest procedure is to choose a hatch pattern and scale from the ribbon, and click within any area that is completely enclosed by objects. You need to specify the scale factor for the hatch to control its size and spacing. Tip: If you set a hatch pattern to be a solid or gradient fill, also consider setting a transparency level on the Hatch Creation tab for interesting overlap effects. Tip: If you need to align the pattern in a hatch, which might be the case with the decking boards above, use the Set Origin option to specify an alignment point. Note: If an area is not completely enclosed, red circles display to indicate places to check for gaps. Enter REDRAW in the Command window to dismiss the red circles.